Russian Foreign Minister Sergei Lavrov met with US Secretary of State John Kerry in Vienna, on the sidelines of the Iran nuclear negotiations, and focused on the fight against terrorism in West Asia. They exchanged "concrete opinions" on how best to consolidate efforts to combat the Islamic State. At their meeting in Vienna on Tuesday, June 30, Russia’s Foreign Minister Sergei Lavrov and U.S. Secretary of State John Kerry discussed how they could most effectively counter the onslaught of the Islamic State across West Asia. The two-hour long meeting, their fourth this year, focused on how, Lavrov said, "to unite the efforts of our two countries and other countries in the region more effectively" in the fight against terrorists of the Islamic State. Lavrov also said in Vienna that Russia intended to avoid rhetorical issues and purposefully "push for joint practical actions." Lavrov reiterated one of his earlier proposals, to build a coalition of regional and non-regional players to jointly tackle the threat of the IS. During the talks which lasted over two hours and saw a variety of "concrete opinions" exchanged, Kerry agreed that "the situation in the region requires more active measures.” Both ministers discussed ways to bring together "all those who believe that ISIS is an absolute evil" and agreed to stop using questionable militant groups for tactical purposes. However, it is unclear exactly what "concrete" measures were agreed on. According to Vitaly Naumkin, director of the Middle East Institute at the Russian Academy of Sciences, the fact that the Russian and American presidents sent their foreign ministers to talk about the issue is itself "a step forward." "It means that there is mutual understanding, a common interest, which doesn't exist concerning Ukraine," Naumkin says. Yet, it is very difficult to figure out what both sides are proposing. The first impediment is the U.S.'s reluctance to cooperate with the Syrian government and the second is either governments' lack of resolve to begin a political dialogue, remarks Naumkin, citing a recent statement made by Syrian Foreign Minister Walid Muallem in Moscow. The distrust on the Syrian side was on display the day before the meeting in Vienna when Muallem held talks with Lavrov and Russian President Vladimir Putin in Moscow. There Muallem said that, "the Americans are demanding a political solution but at the same time are allotting billions of dollars in the support of terrorists," referring to the various groups fighting in opposition to the official Syrian government, several of which Washington supports with non-lethal aid and training. Additionally, the conflict between the authorities in Damascus and Turkey, which is demanding the resignation of the Syrian government, is casting doubts on the possibility of forming a coalition in the region. Experts are unsure whether to expect concrete action in the fight against ISIS in the short term. The process of consolidation may become a long or a short-term one, notes Naumkin, since ISIS is advancing quickly and "this could push the disagreeing sides to embrace each other." Other analysts interviewed by RIR do not believe in the coalition. The coalition already exists - it is the U.S. and its satellites, and it is not working, says Alexei Mukhin, a political analyst and the general director of the independent Center for Political Information. "On the contrary, experts are noticing that it was the coalition's actions that had led to the expansion of ISIS's control over various territories," Mukhin said. Deputy Dean of the World Economy and World Policy Department at the Higher School of Economics Andrei Suzdaltsev believes that while sanctions are in effect against Russia, it will never enter any coalition. In his words, ISIS is a consequence of America's policy in the Middle East. But to destroy it, America does not have enough strength. Experts believe that schemes such as air raids and targeted strikes have also been unsuccessful. "The moment in which they could have worked is gone," says Mukhin. "Most likely the talks (between Lavrov and Kerry) were about the consolidated efforts against the mobilization of ISIS volunteers in various countries," adding that it is necessary to impose an economic blockade on ISIS. "While certain countries continue buying oil from ISIS, while weapons are flowing into ISIS territory, unfortunately it will be impossible to stop its expansion,” says Mukhin. 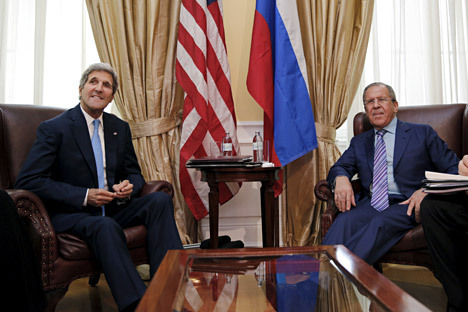 “Perhaps this is what Kerry and Lavrov talked about."